Jose Bautista would be an ideal fit for the Mets if the Blue Jays were willing to move him. This offseason will be a pivotal one for the New York Mets as the team has both money to spend and needs to fill. But not all will be solved by shopping for free agents. Sandy Alderson may have to make a trade or two to net the kind of player the Mets want and need. Among those they would have interest in are Carlos Gonzalez and Troy Tulowitzki from the Rockies, and Giancarlo Stanton from the Marlins. But those players are not on the market. Who might be available from a “pie in the sky” perspective for you to pine for this winter? We take a look at a few possibilities and allow you to weigh in on whether Alderson should make the call to pursue a deal. Why he would be available: Fox Sports’ Ken Rosenthal has noted that the Blue Jays have indicated a willingness to listen to offers for their premier offensive players -- Bautista and first baseman Edwin Encarnacion. Bautista has a friendly contract in that his team is on the hook for two years and $28 million, with a $14 million club option in 2016. Pros: Bautista is exactly the type of hitter that manager Terry Collins was describing when he made an end-of-season wish for someone who could hit behind David Wright. 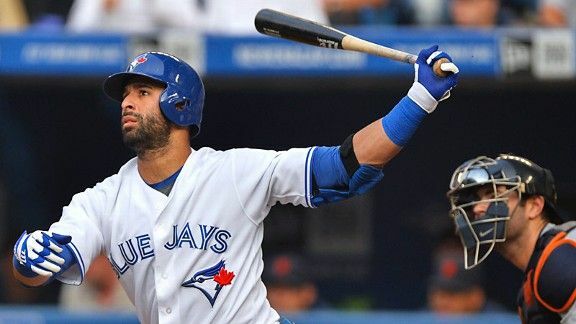 Bautista has the best home run rate in the majors over the past four seasons, averaging one every dozen at-bats, and he’s equally adept at hitting them on the road as he was in hitter-friendly Rogers Centre. Bautista doesn’t hit many cheap home runs. Via Hittrackeronline.com, all but one of his homers this season would have gone out of at least half the major league ballparks. Bautista is also a hitter who is careful not to chase bad pitches. His strikeout total is reasonable and his 13 percent walk rate in 2013 ranked among the top dozen hitters in the game. Though Bautista doesn’t cover a lot of ground in right field, he makes up for it because his throwing arm is a deterrent to baserunners. Despite the time missed due to injuries, Bautista’s arm rated second-best among right fielders per defensive runs saved (which looks at how often baserunners advanced an extra base when an outfielder fielded a ball). We’re not the first to point out Bautista’s appeal. He’s a popular choice among fans and other blogs. Expect to hear his name on talk shows and other venues this winter. Cons: There is some risk involved in dealing for Bautista. He has played in 210 of 324 games the past two seasons due to injuries and missed the end of 2013 due to a hip injury. At 33, he may have reached the age of decline/breakdown, and the Blue Jays may want to cash in while they still can. Though Bautista is a great power hitter, he doesn’t hit for a high average. He has hit .241 and .259 the past two seasons and has a lifetime batting average of .254 in more than 3,600 at-bats. The cost: We asked ESPN Insider Jim Bowden, the former general manager of the Reds and Nationals, what the potential cost would be to land Bautista. He came up with the idea of a package that included Jonathon Niese and two prospects, one being Cesar Puello (the idea being to return a power-hitting prospect to the Blue Jays). We imagine the other prospect would have to be one of the Mets' higher-end youngsters, though that’s just a guess. Should Sandy “make the call”? If you were going to describe the skill sets of what the Mets were looking to obtain this offseason, a player of Bautista’s caliber would be near the top of the list. This is one we would encourage the Mets to be aggressive in pursuing, if for no other reason than to show that they are serious about bringing in a couple of legit hitters. What do you think? Should the Mets pursue a trade for Jose Bautista, and if so, what should they give up? Share your thoughts in the comments.